Scott Glassell, try scorer for Featherstone Lions. Featherstone Lions and Lock Lane bowed out of the Coral Challenge Cup after gallant efforts against professional league clubs. 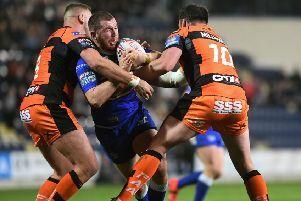 In their fourth round ties, the Lions took on League One Doncaster in a game played at Featherstone Rovers’ LD Nutrition Stadium ground while Lock Lane travelled to play Betfred Championship side Batley Bulldogs at the Fox’s Biscuits Stadium. Connor Land, try scorer for Lock Lane. Both managed to score points, but faded in the closing stages with Featherstone losing 46-6 and Lane going down 62-6. The Lions only trailed 20-6 at half-time with a try by Scott Glassell that was converted by Ian Jackson. But they were unable to cross the line again after the break with Doncaster eventually running in nine tries through Kieran Cross (three), Matty Chrimes (two), Sam Doherty, former Castleford Tigers player Richard Owen, Stefanos Bastas and Conner Bower. Another ex-cas player, Jordan Howden, kicked five goals. Lock Lane trailed 24-6 at the break in their fourth round tie at Batley after Connor Land crossed for a try for the Castleford-based team. The Bulldogs eventually had too much firepower for Lane with their tries coming from Wayne Reittie (three), Louis Jouffret (two), Sam Smeaton (two), Danny Yates, Tyler Dickinson, Michael Ward, Tom Hemmingway. Conversions were kicked by Dave Scott (four) and Jouffret (five). For match reports, see Thursday’s edition of the Pontefract & Castleford Express.